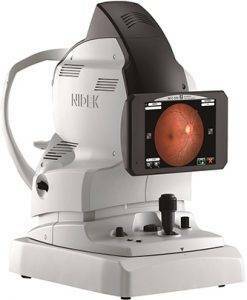 The NIDEK AFC-330 Fundus camera comes with an all-in-one built-in computer and a 12-megapixel camera. With almost no user assistance required, this Fundus camera will automatically position itself to take perfect images, even of the most complicated patients and smallest pupils, every time. 100% approved by the NHS for diabetic retinal screening, the high quality imaging is in a class by itself. The completely automated features of the AFC-330, very low flash and near-silent image capture makes this a fast and very comfortable experience for your patients. As well, the amazing adjustable tilting touch screen allows for easier data entry and image review than ever before, and all in one camera unit! Images are quickly and easily exported by USB as well as through easy networking capabilities. The AFC-330 is also perfectly compatible with almost all third party software for diabetic retinal screening or patient management. Taking retinal or anterior images of the eye has never been easier, quicker or more successful. Q: Please describe what retinal imaging is used for and give a basic sense of how it works. A: Retinal imaging basically is a high powered photograph of the inside of the human eye. Q: Why is retinal imaging important, and what extra components of the retina and eye does it allow you to examine? A: It is a very useful instrument because of its ability to magnify with such high resolution. Basically, it can magnify structures and diseases in the eye that are the size of the end of a pin and can enlarge them to the size of a computer monitor. Our AFC-330 will also allow a 3D five of structures so we can determine elevation and swelling if it is present. Q: What types of eye diseases and disorders can be discovered using retinal imaging and analysis? A: There have been many times that our AFC-330 has shown small imperfections that were previous undiagnosed. When the optometrist looks in the patient’s eyes, you have to take in consideration the hand-eye coordination of the doctor and the ability of the patient to hold still. Even with the patient being compliant to the bright lights and not blinking, you have the issues of people still needing to breath and having minor head movements. With a digital retinal image, you have a fixed image and you can brighten the image of the picture without causing any light sensitivity to the patient. There are over 100 diseases of the eye that can be captured with a digital retinal camera. Q: Most practices in your area do not have this technological capability. What is it about this particular technology that you find most exciting; the component that made you feel you need to invest in this for your practice, and why did you choose this particular model and manufacturer? A: What is beneficial to the patient about the AFC-300 is when I try to describe a disease to them like macular degeneration. I can spend time trying to explain the problem, but when I can simply point to the problem on the monitor and show the patient the disease, it really proves true the adage, “A picture is worth a thousand words.” I chose the AFC-330 because it can be administered without needing to dilate the patient and it has an auto image capture so when the camera is lined up properly it automatically takes an image. Q: Can you describe the patient experience when experiencing retinal imaging? A: The experience is similar to any handheld camera. The flash is of the same intensity. Q: Do the patients that walk through your doors day in and day out, appreciate the upgrade in technology? A: Absolutely, I bought my first retinal camera in 2005 for one of our locations. After the first week I realized most patients wanted this advanced eye exam so I bought 6 more the next week for the other offices. Since then we now have 10 retinal cameras. Q: For what patients do you use retinal imaging? Are there certain patients that you need this technology more in order to meet their needs? A: We recommend everybody have a digital image of their eyes. Just because you have normal vision doesn’t mean you are not starting to show early signs of a retinal disease that we can find with the camera before it encroaches on your vision. Patients who know they already have a retinal disease or patients taking medication that can cause vision problems should definitely consider having the additional testing using our advanced technology.